We can see that by November 2009, it was clear that government income would in fact be slightly higher than had been expected for the previous year (2008-09). Quite simply, the GFC did not blow any holes in the budget at all. As recently as November, the Government fully expected its revenues for this year to finish higher than they were for 2008-09. So, why is there a problem with the budget then? Three important things to notice. 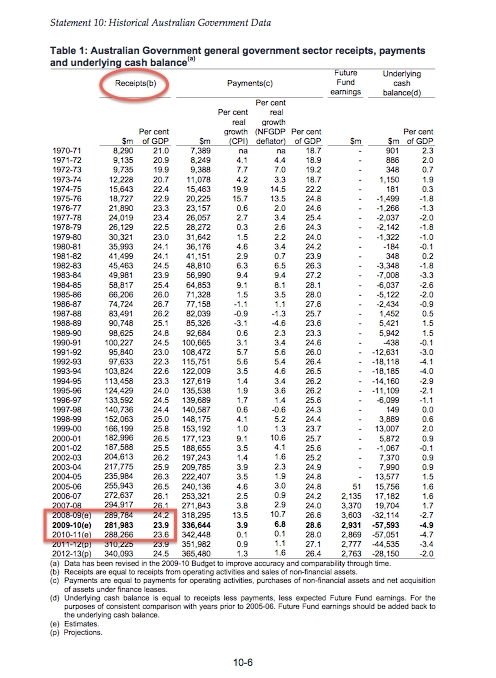 Firstly, the government had revised up its original estimate for “Receipts” in the 2008-09 year, by $2.8bn. So they had received more income than originally expected for that year. Secondly, the government had also revised up its original estimate for “Payments” in this year, 2009-10, by $1.8bn. In other words, in just 6 months between the May 2009 Budget and the November 2009 MYEFO, their “Payments” (ie, spending) blew out by $1.8bn over the original estimate. Thirdly, notice that the government “Payments” figure of $338.39bn for 2009-10, is an increase of $22.347bn on 2008-09. And that was an increase of $44.203bn on 2007-08. In the most recently updated Government budget figures, for the 2007-08 year the budget showed “Receipts” of $294.917bn, versus “Payments” of $271.843bn. That is, a Howard Government-delivered surplus of $23.074bn. 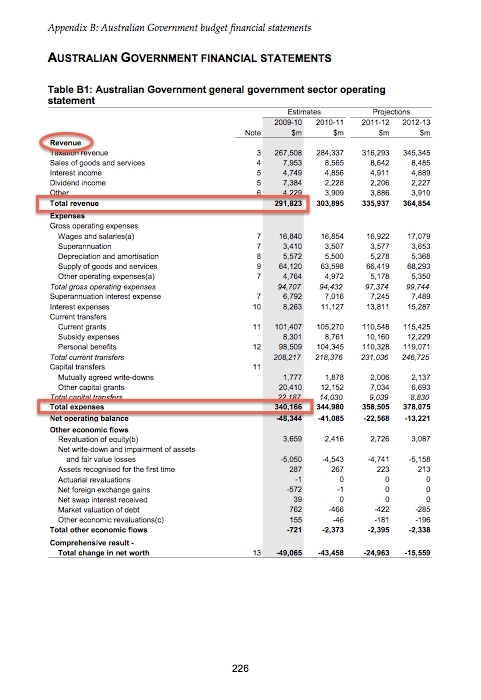 By November 2009, the Budget MYEFO (Appendix B, Table B1 above) showed that Rudd Government “Receipts” were expected to be down by just $3.01bn compared with 2007-08, and a mere $0.77bn compared with 2008-09. Simply, the GFC has actually had almost nil impact on government revenues. We can see that even back in the May 2009 Budget, the government had estimated only a 2.7% fall in “Receipts” for 2009-10 compared with 2008-09. Lindsay Tanner lied. Rudd Government “Payments” (spending), however, are a very, very different story. In 2007-08, Government “Payments” were $271.843bn. But by November 2009, the Rudd Government’s MYEFO (Appendix B, Table B1 above) shows that “Payments” have blown out to an estimated $340.166bn. That’s a massive increase in annual government spending – an extra $68.323bn per annum versus 2007-08, and an extra $24.12bn versus 2008-09. 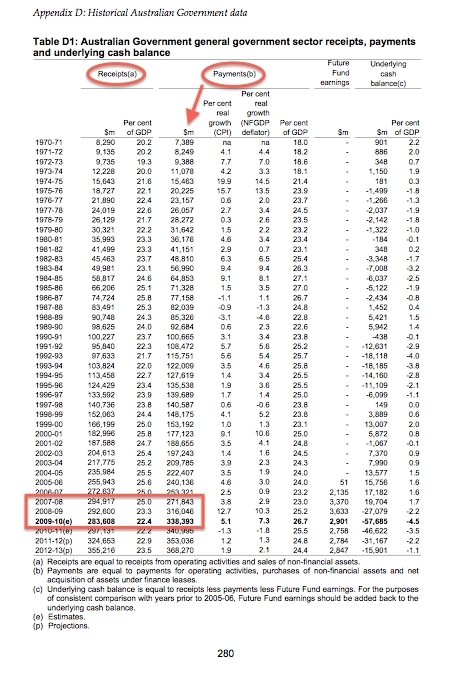 As you can see, Lindsay Tanner lies when he tries to blame the GFC for the Rudd Government’s “huge budget problem”. There is almost no loss of revenue – the “huge hole” in the budget is entirely due to panicked, massive, wasteful Rudd Government spending. Lindsay Tanner lies when he accuses the Opposition of punching “a huge hole in our savings initiatives”. The $2bn “savings” related to the health care rebate – a broken election promise by Rudd – is a tiny fraction of the massive spending spree that Tanner’s team have done in two short years. And it is a tiny fraction of the $48.49bn in Interest-only debt repayments, that we-the-taxpayers must pay back in just four years to 2013. The Rudd Government has no plan whatsoever to return the budget to surplus. They are still borrowing well over $1 billion a week. And their “plan” is nothing more than hope. The hope that another China-fueled mining boom will rescue the budget for them. This is an increasingly ridiculous hope, as more evidence emerges almost daily of huge structural problems in China’s property and banking sectors. Lindsay Tanner certainly will not tell Australia the simple truth. That our debt is too big already. The facts of history show, we cannot pay it back. We also know the government is lying about the budget, because buried in the 2009-10 MYEFO budget papers is proof that the government has fiddled the books. 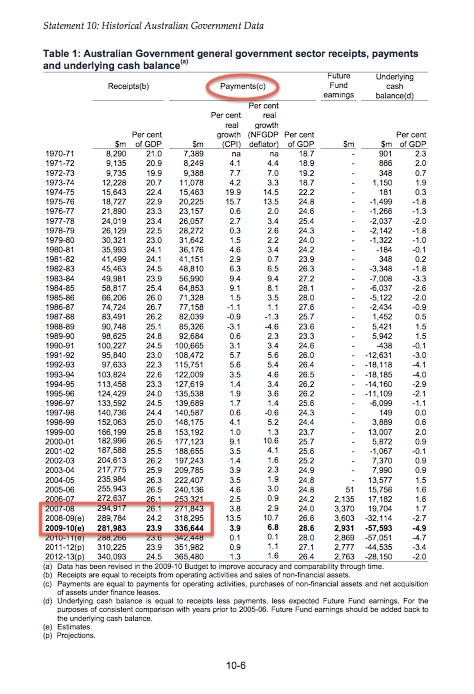 Specifically, to “hide the increase” in government spending as a % of GDP. See my article here. The figures don’t lie. The problem is that perhaps less than 10% of Australians have the attention span to read and understand this post. Somehow this message has to be simplified and gotten out into the MSM and to the parliamentarians. I don’t know if your argument is correct, not that I’m doubting your integrity or the facts, but armed with this, one or more highly paid commentators/journalists should be using the limitless resources they have to validate your commentary and hold Tanner et al to account! Again. Well done. And as an aging and weary taxpayer, I say thank you. I had suspected that Barnaby was right. However what really worries me is that crude oil production stopped increasing in May2005 reached a peak in July 2008 which caused the GFC. It is reliably expected that oil production will start falling in 2014. All this means that Peak Oil is NOW ! As we go down the slope we need considerable funds to retrain people to cope with the unemployment that will increase and to restructure our economy. However this Rudd government has given us debts instead. Bl**dy idiots ! they were warned about this but chose to ignore the problem. I believe Barnaby spoke about peak oil some considerable time ago, but please Barnaby, ignore the unspoken agreement to ignore peak oil and shout our problem from the Senate.